The Chocolate Shop in Cork’s English Market is a treasure trove, packed with good things. And good people there too in Rose and Niall who’ll help you get exactly what you’re looking for. I was on the lookout for a Taste of the Week. In truth, I could have had closed my eyes, put out a hand and anything I touched would have fitted the bill. 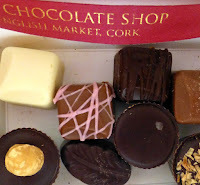 But I asked them to fill a little box with some delicious pieces, some by Wilkies Chocolate from Midleton and the others by Skelligs Chocolate from County Kerry. I had my Taste of the Week, on the double! They opened in 2000. 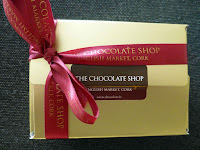 They know their stuff - were very impressive at a recent Chocolate/Whiskey matching event in the River Lee Hotel. They are independent of any single manufacturer or franchise and therefore free to source only the best quality chocolate from the best artisan chocolatiers throughout the world. You’ll also find related items, such as Nougat. And they also sell Hadji Bey’s Turkish Delight, a long standing favourite in these parts. 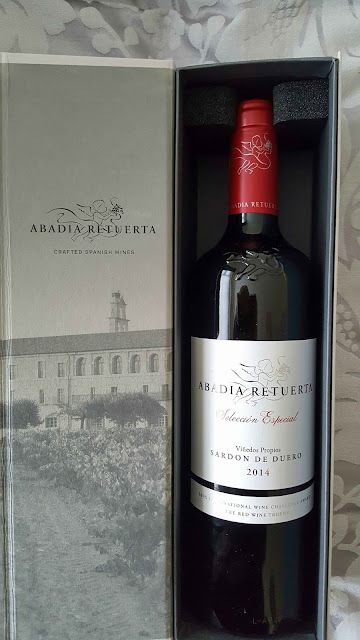 Check them out and find your your own taste of the week!